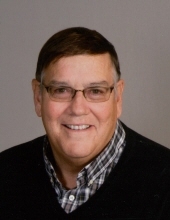 William “Bill” Neuzil, 66, died Sunday, March 17, 2019 at his home. Mass of Christian Burial will be celebrated Friday at 10 AM at St. Patrick’s Catholic Church in Iowa City with the Very Rev. Rudolph Juarez officiating. Visitation will be Thursday from 4 to 7 PM at Lensing Funeral & Cremation Service in Iowa City, where a Rosary will be recited at 3:30 PM. Burial will be at St. Joseph Cemetery. In lieu of flowers a memorial fund has been established in Bill’s name. Bill was born July 4, 1952 in Iowa City, the son of Gerald Francis and Teresa (Donohue) Neuzil. He was a 1970 graduate of Regina High School and an active member of 4-H. Bill attended the University of Iowa where he played football for the Hawkeyes. On August 23, 1986 Bill married Julie M. Burns at St. Wenceslaus Church. Bill was a longtime Johnson County farmer with a strong work ethic, a contagious smile, and a big heart. As his daughters were growing up Bill was involved in coaching their sports teams and was always their biggest fan on the sidelines. Most important to Bill were his family and friends, and he was always available to lend a helping hand. He was a member of St. Patrick’s Church, Knights of Columbus Council 842, the Eagles and the Moose. Bill is survived by his loving wife, Julie and their daughters, Katherine Jean “Katie” Neuzil of Ely and Laura Marie Neuzil of Iowa City and his furry sidekick Murphy; his sister, Mary Jean Neuzil Cochran (Danny) of Ankeny; his brothers and sisters-in-law, Stuart Burns (Carol), Janet Johnson, Stan Burns (Shellie), Steve Burns, Brian Burns (Nancy Blake) and Marlene “Charlie” Peters (Bob); his nieces and nephews who he dearly loved and his extended family. To send flowers or a remembrance gift to the family of William " Bill " Neuzil, please visit our Tribute Store. A Rosary will be recited at 3:30 PM. "Email Address" would like to share the life celebration of William " Bill " Neuzil. Click on the "link" to go to share a favorite memory or leave a condolence message for the family.